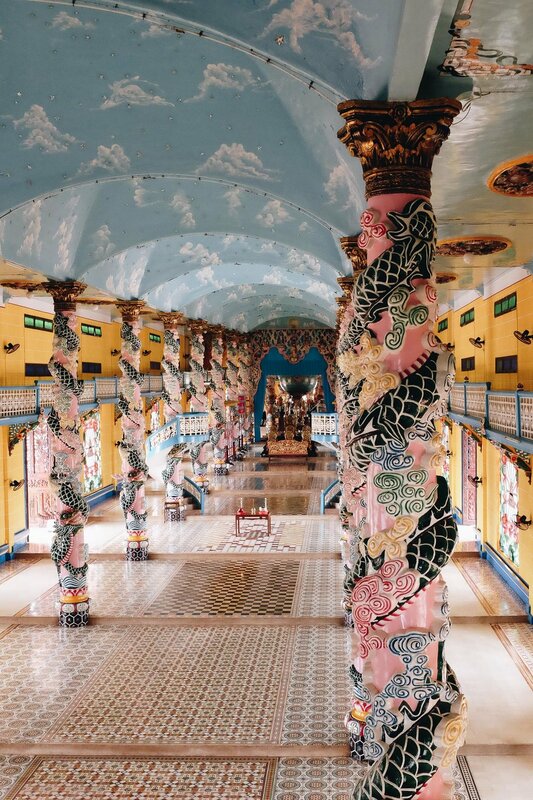 Cao Dai Holy See: The weird and wonderful birthplace of Cao Daism in Vietnam — Opium Teahouse. ‘Never walk in front of the Holy See while mass is taking place. Women should enter through the left side of the building. Men on the right’ were the rules laid down by my guide, Quang Vu. We got there just before midday prayers, and the complex was buzzing with devotees. All covered head to toe in white robes, the only thing separating them the colourful armbands indicating their seniority within the church. 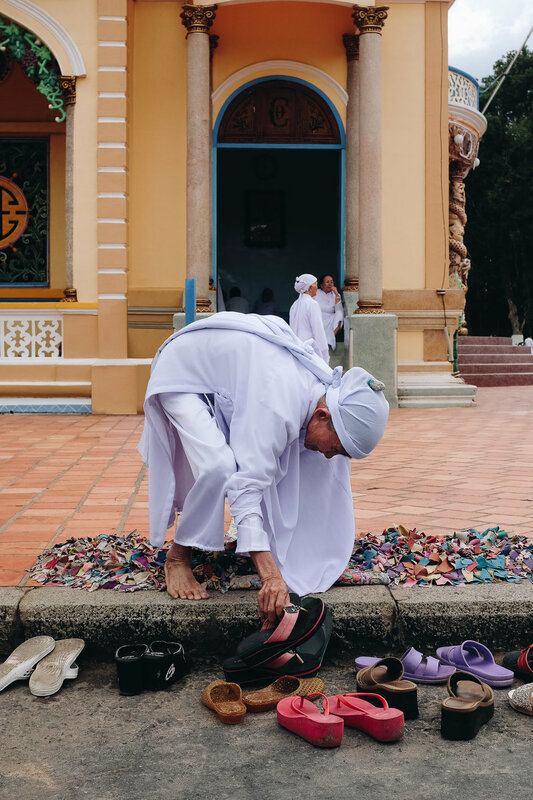 I don’t know what triggered me to embark on a journey to see a church two an half hours away from Ho Chi Minh City while the city is a treasure trove of temples, museums and art neighbourhoods, but there I was, standing respectfully on the left side of the garish Thanh That Cao Dai – Cao Dai Holy See. With two massive towers on each side of the building and a long central nave, the Holy See structure resembles that of a cathedral. The decoration, however, is a far cry from the gloomy monolithic exteriors of Christian houses of prayer. Creamy yellow walls, a roof with multiple eaves like pagodas, a dome similar to those found in mosques, painted as a globe with a mystical creature on top of it, and an all-seeing eye representing God. 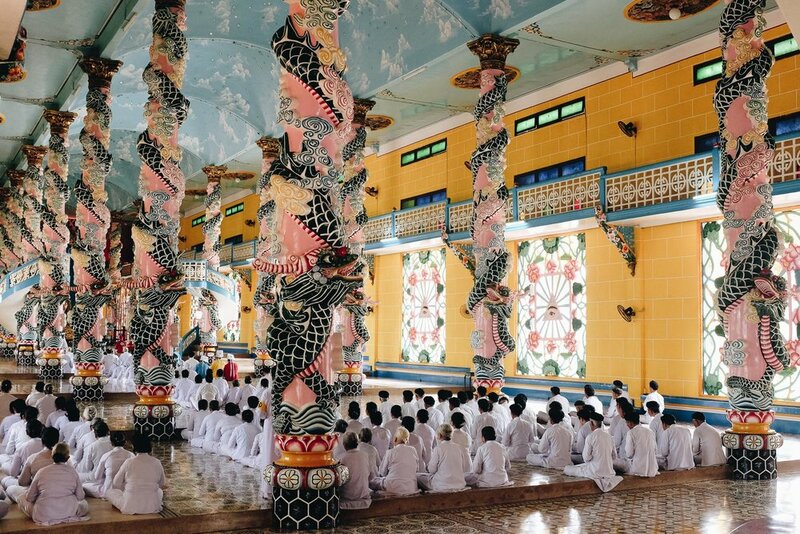 The Cao Dai faith is, according to theologists, a syncretistic religion combining elements from the world’s leading religions such as Buddhism, Confucianism, Christianity, Taoism among others. Which explains the bizarre pastiche of symbols used to embellish the interior of the building and make the exterior look tame by comparison. Rows of columns – twenty-eight to be precise – with colourful entangled dragons. Different sets of tiles covering the entire nave, a ceiling painted like a sky together with sparkling crystals as starts. Paintings of saints. Chinese unicorns. Phoenixes. Turtles. Lotuses represented in all shapes and forms. If Iris Apfel ever reincarnated into a building, this would be it as the Caodaism, and the geriatric starlet seems to share the same stylistic approach: ‘everything and the kitchen sink’. 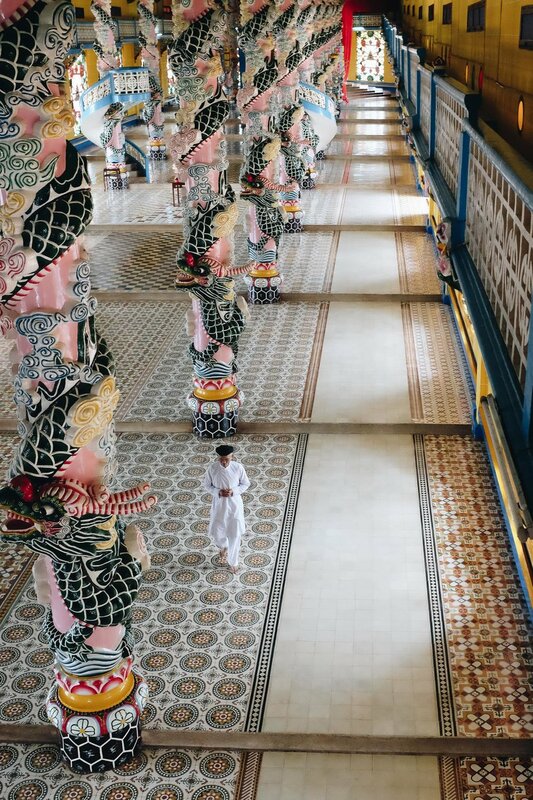 While most of my companions had little interest in the building or the peculiar Cao Dai religion and seemed to endure this part of the tour with stoic nonchalance, I was delighted in having an inside view into one of the most eccentric faiths in the world. Then the gong first sounded and devotees trickled down the nave. First the priests with their pointy hats and different coloured robes, then rows and rows of white-clad members followed suit. As everyone kelt down – women on the left, men on the right – a quartet of string instruments joined the ongoing gong and chants started. From the gallery balcony above, visitors observing the event suddenly became quiet, as if the start of prayers soothed the ostentatious building decor and transported everything to another realm. A quieter, simpler one. 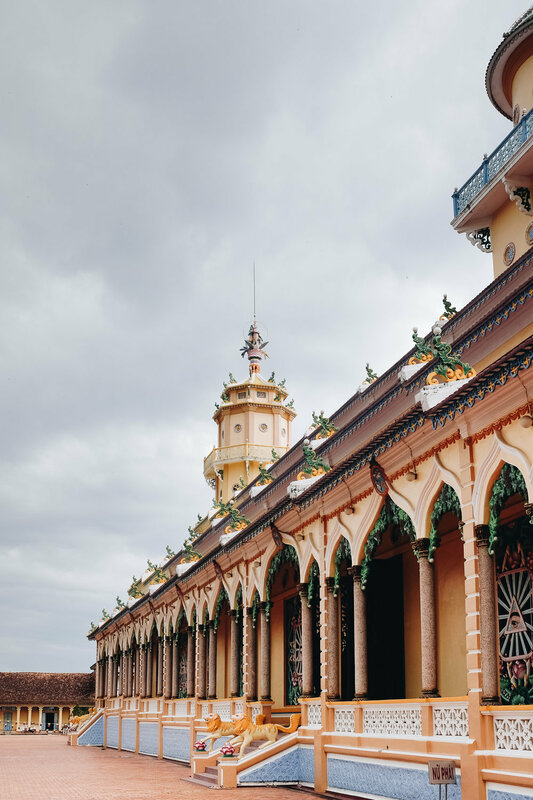 The Cao Dai Holy See is located ninety kilometres north-west of Ho Chi Minh City in Tây-Ninh Province. It is worth visiting during prayer sessions (four times a day), with midday prayers being the most popular one with tours leaving HCMC. Most tours that offer a visit to Cao Dai Holy See also combine a visit to the Cu Chi Tunnels. These tours can be easily organized in HCMC either directly though the tour agency or hotels.